The most searched Google term leading viewers to my site is ‘vegan coleslaw’. So I thought I’d give you yet another version just in time for summer! 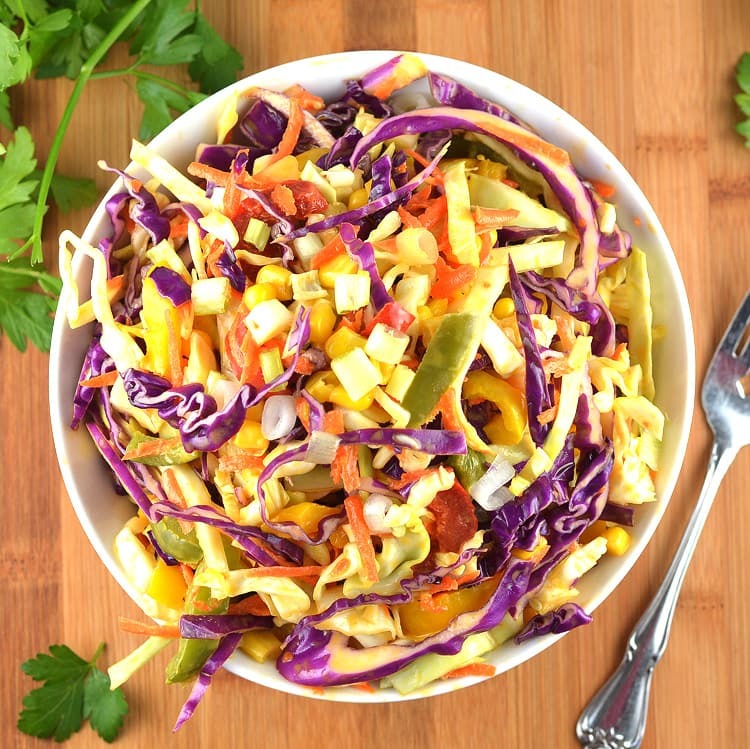 This is more of a confetti-type slaw, but I’ll also include photos below with links to a vegan carrot slaw and of course, the traditional creamy vegan coleslaw. We used a mix of red (purple) and green cabbages along with carrots, red, yellow and green bell peppers, onions and corn. The dressings for all three slaw’s I’ve made are different, so feel free to use them interchangeably. 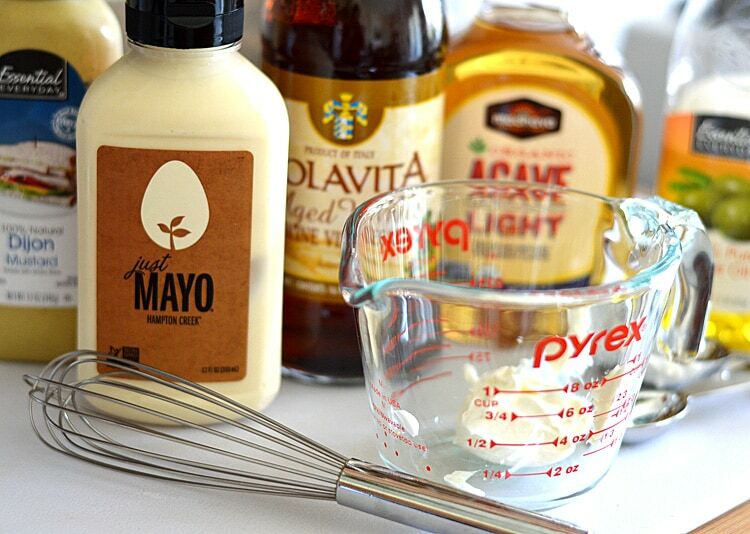 This is a white wine vinegar-based dressing that also incorporates agave nectar (to taste), vegan sour cream (I use Tofutti’s Better Than Sour Cream) and vegan mayonnaise (I use Just Mayo) – if you want to make your own sour cream and/or mayo substitutes, you certainly can. On the Internet you can find a plethora of recipes for each of them. Since the amount used is so minimal, you could also use cashew cream, pureed tofu, canned coconut milk, etc. Lastly, we added a bit of Dijon mustard and olive oil to bring everything together. Season with salt and pepper. 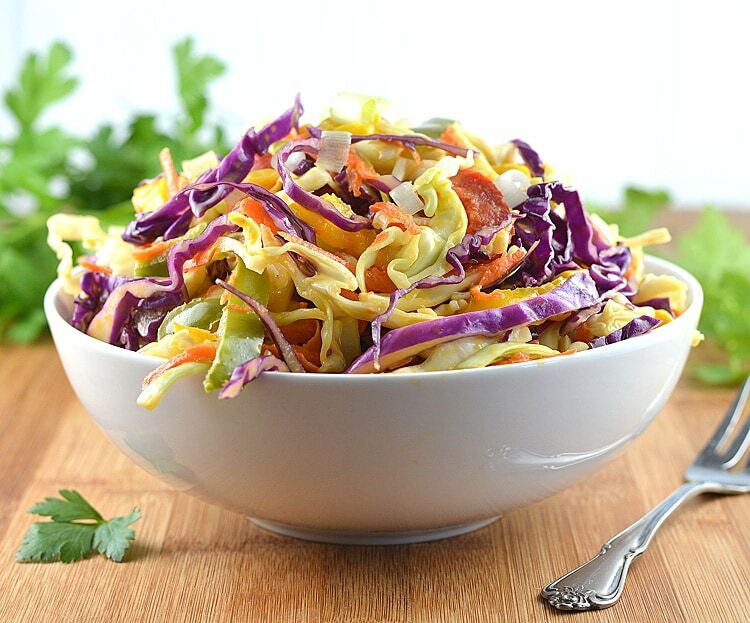 This slaw is delicious right now, but if you let it sit for a bit…it gets even better. The flavors begin to meld. Top with a garnish of green onions and/or parsley before serving. 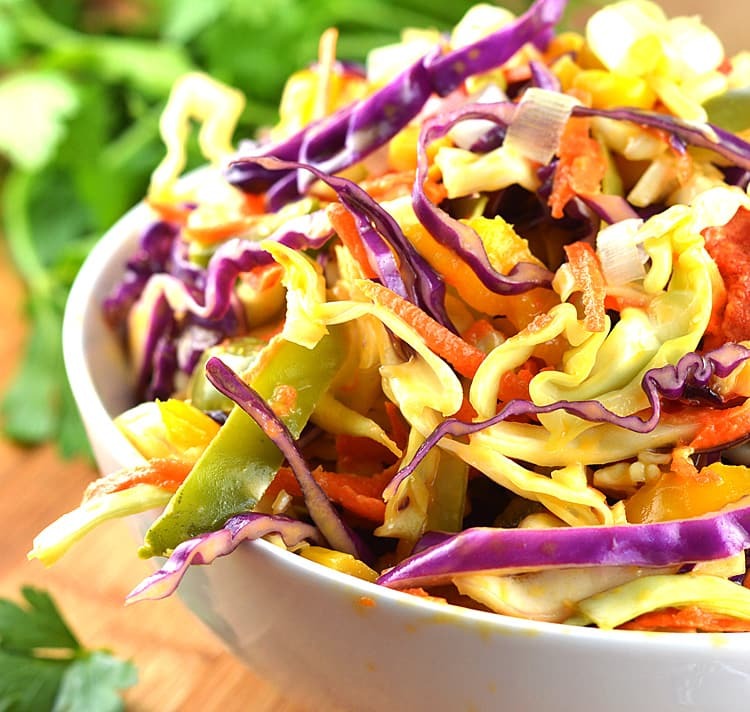 This vegan Carrot Slaw is a sweeter version and one I found I really enjoyed. We used rainbow colored carrots, but regular carrots work just fine. 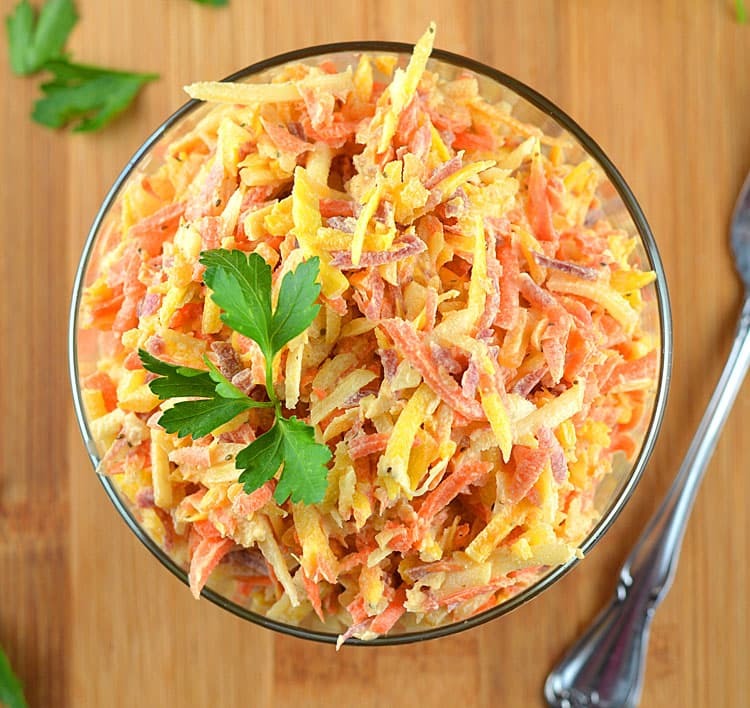 Here’s the link for my Carrot Slaw. 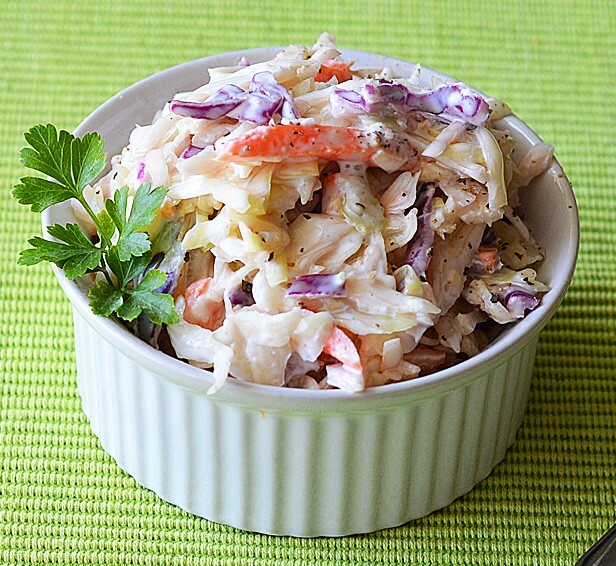 And, if you are a traditionalist…this is THE Vegan Coleslaw for you! This is my most popular recipe to date. Here is the link for this classic Vegan Coleslaw. Fold everything together and ideally, allow to sit covered in the refrigerator for at least 30 minutes. Taste for seasoning and add salt or pepper as needed. Garnish with green onions and/or fresh parsley.